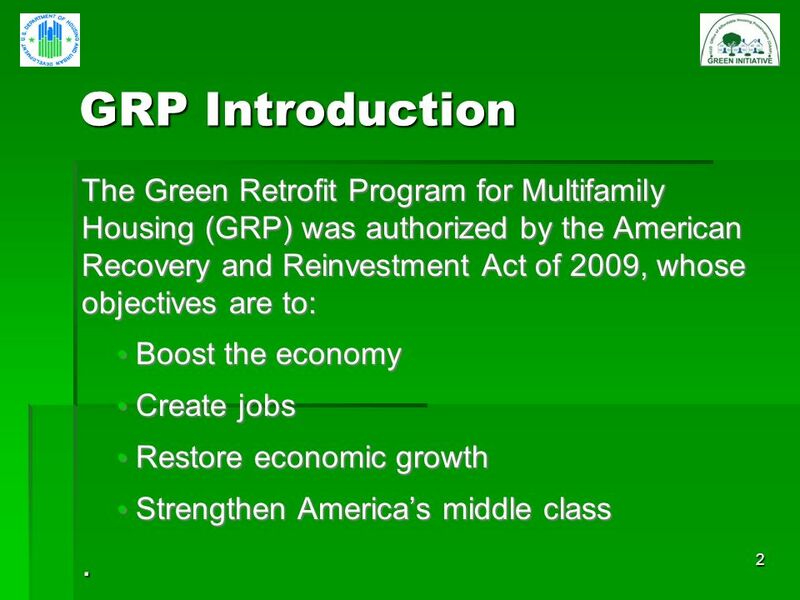 2 2 GRP Introduction GRP Introduction The Green Retrofit Program for Multifamily Housing (GRP) was authorized by the American Recovery and Reinvestment Act of 2009, whose objectives are to: Boost the economy Boost the economy Create jobs Create jobs Restore economic growth Restore economic growth Strengthen Americas middle class Strengthen Americas middle class. 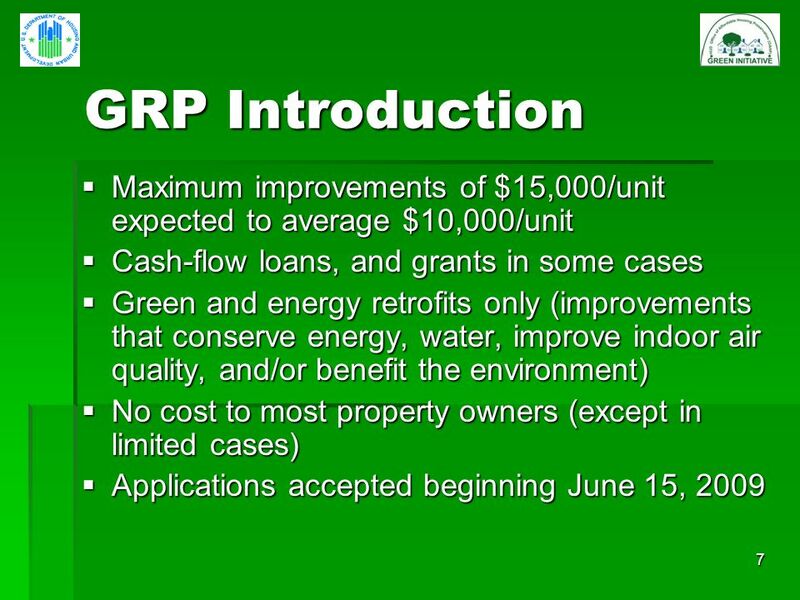 4 4 GRP Introduction GRP Introduction Program guidance is provided in Housing Notice H-09-02, published May 13, 2009. 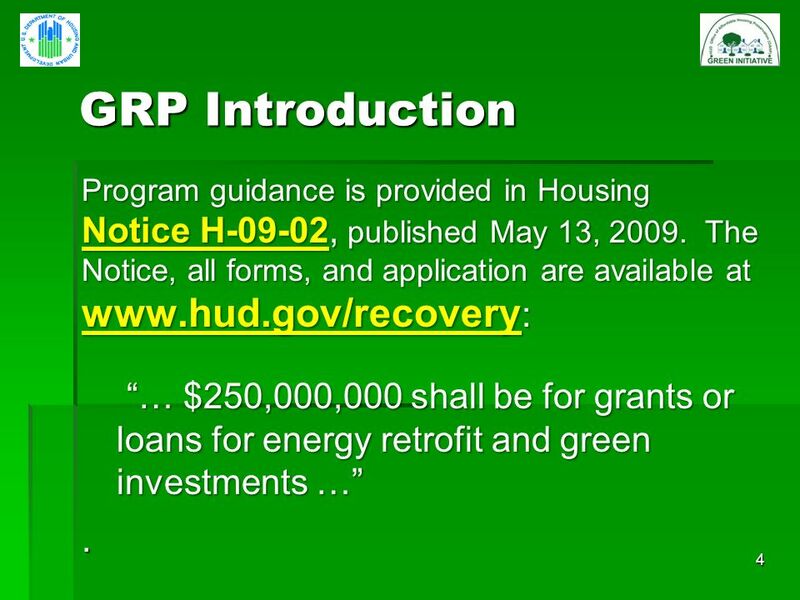 The Notice, all forms, and application are available at www.hud.gov/recovery : … $250,000,000 shall be for grants or loans for energy retrofit and green investments … … $250,000,000 shall be for grants or loans for energy retrofit and green investments …. 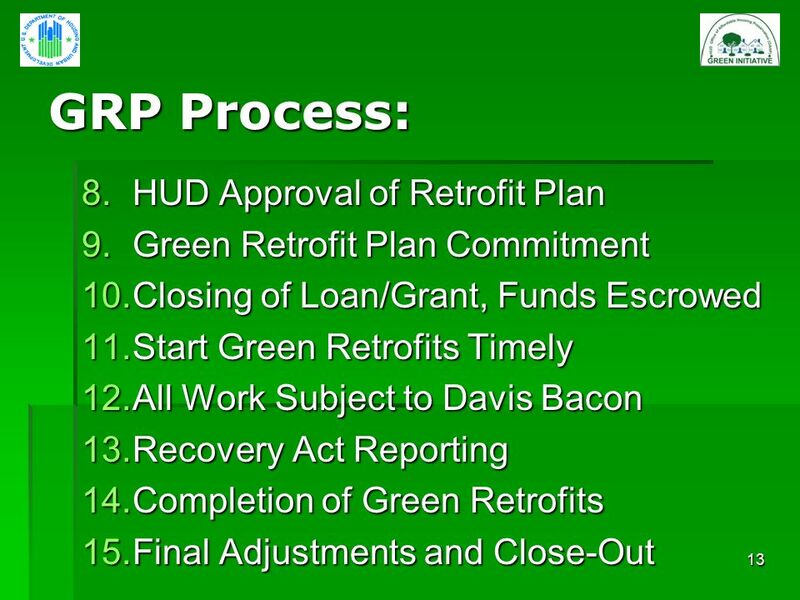 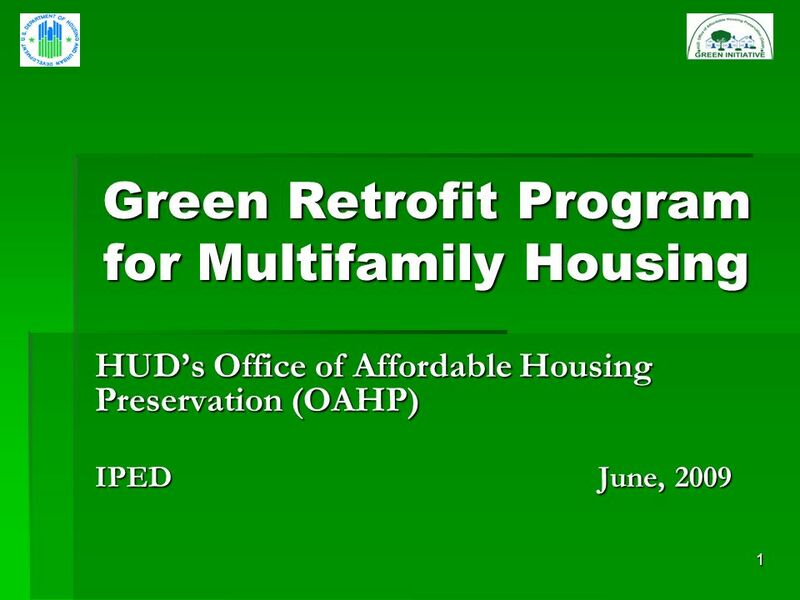 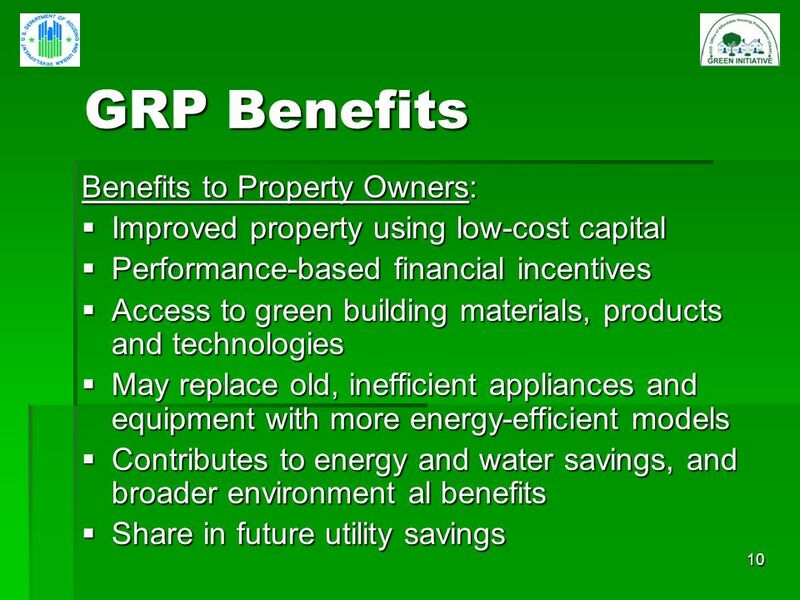 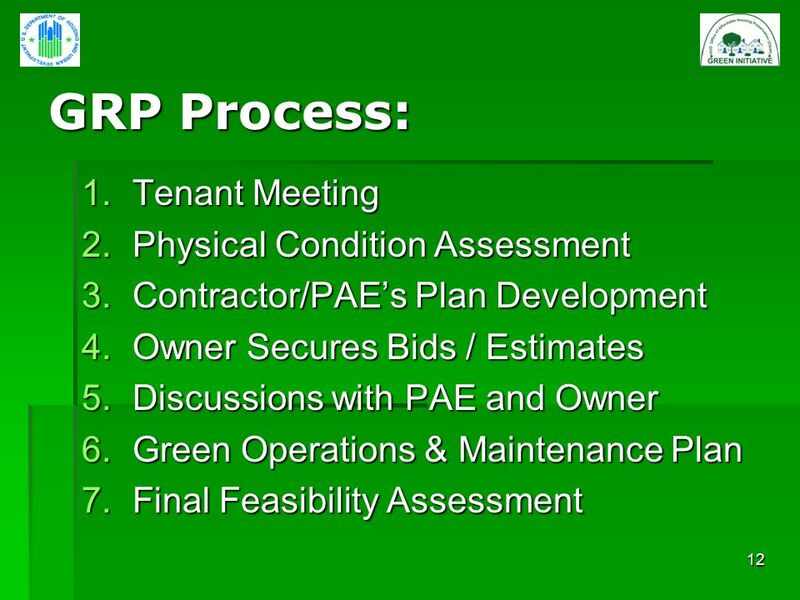 Download ppt "1 Green Retrofit Program for Multifamily Housing HUDs Office of Affordable Housing Preservation (OAHP) IPED June, 2009." 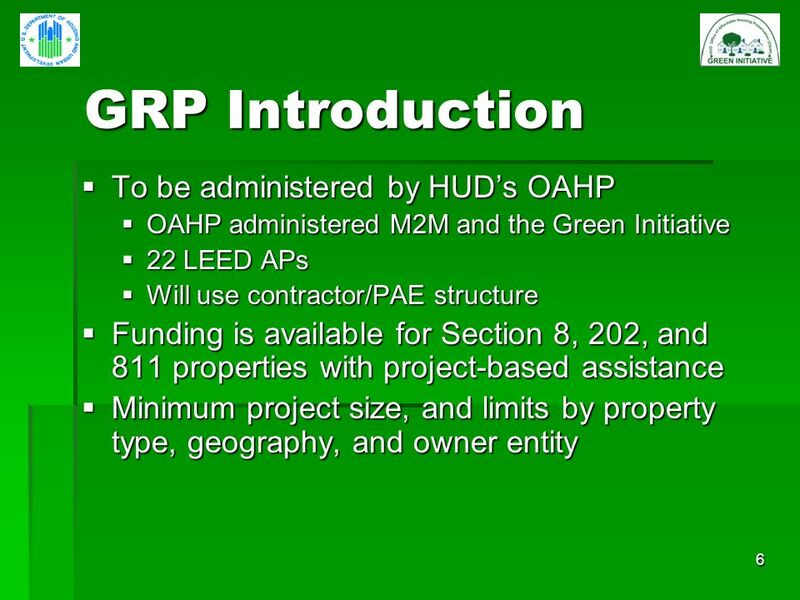 1 Green Initiative HUDs Office of Affordable Housing Preservation (OAHP) IPED – Enterprise Chicago August, 2008. 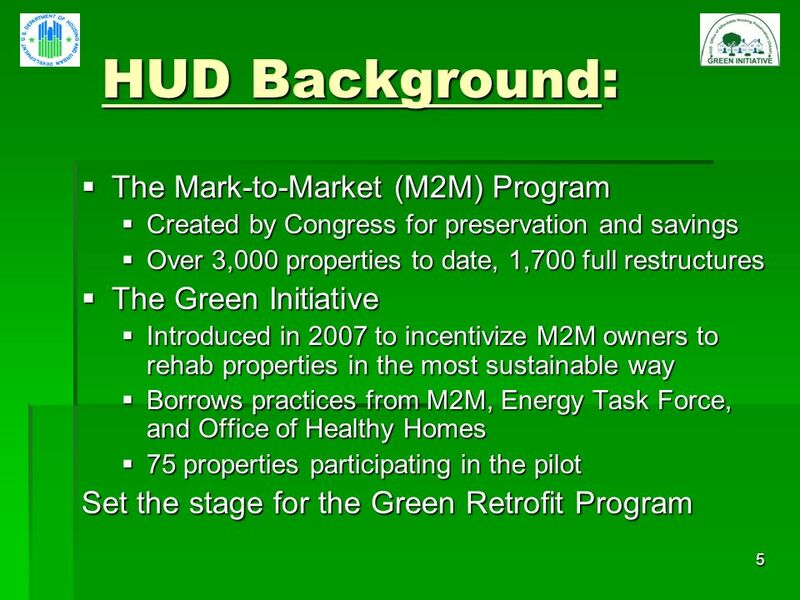 1 Green Initiative HUDs Office of Affordable Housing Preservation (OAHP) IPED Miami February, 2008. 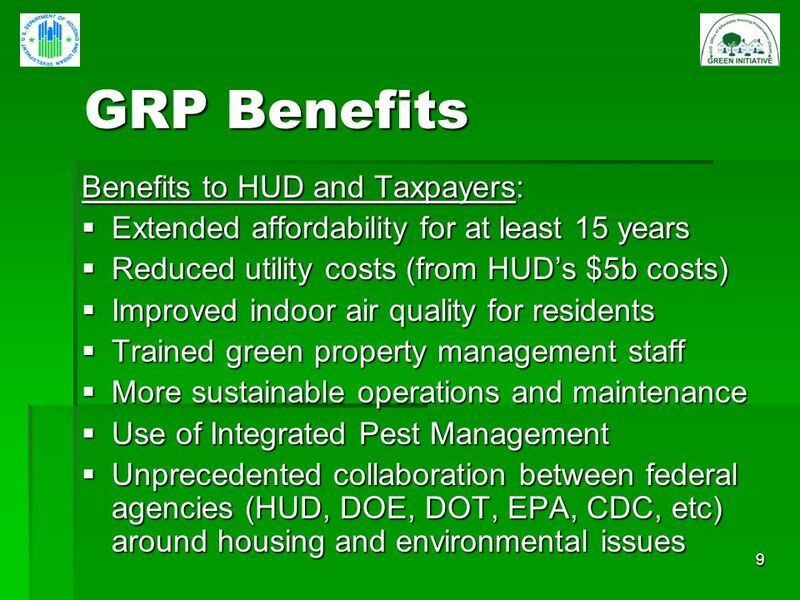 Green Infrastructure for Clean Water Act of 2009 H.R Becky Hammer – Associate Advocate, Water Program – Natural Resources Defense Council. 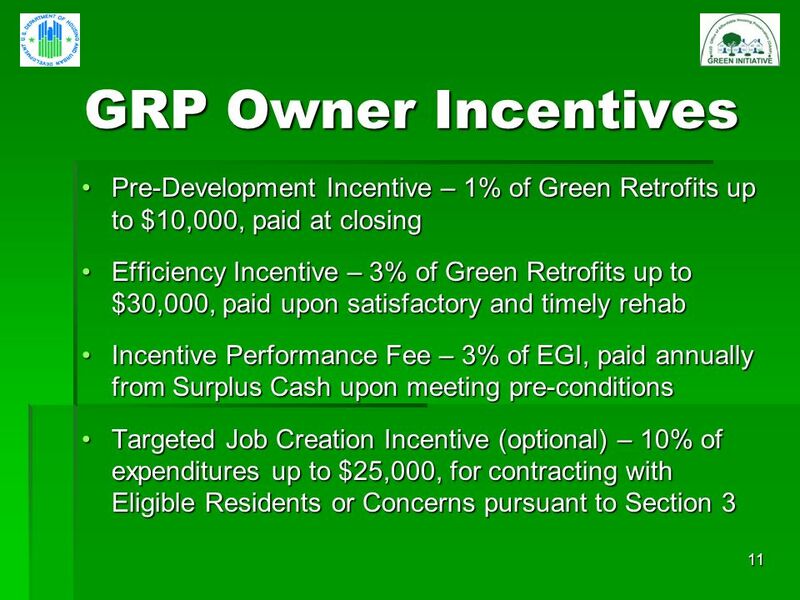 National Center for Construction Education & Research Affiliated with the University of Florida Greening the Workforce. 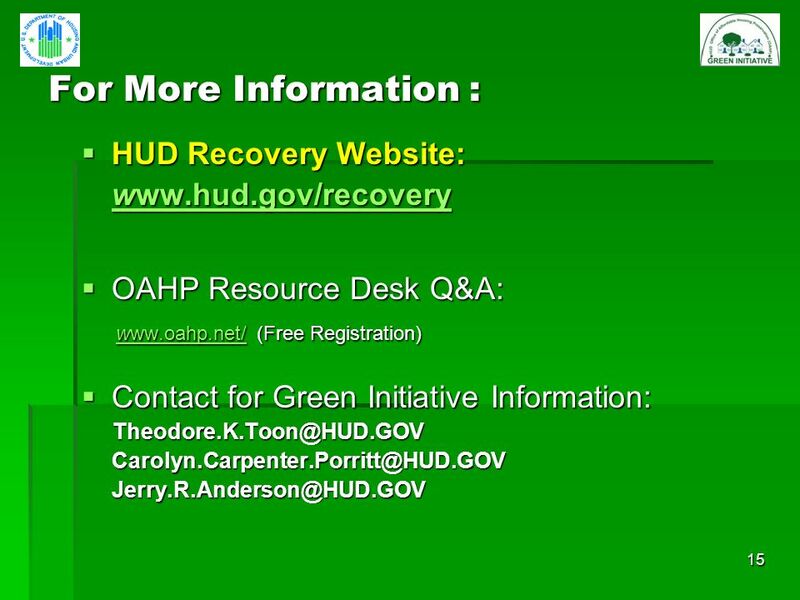 Welcome to... Companion PowerPoint Presentation for the Introduction to Housing textbook. 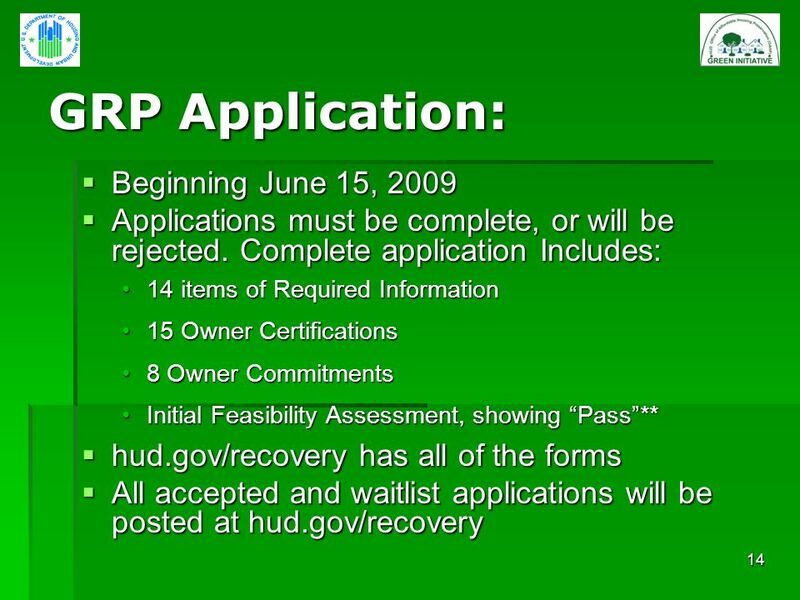 NIFA AFFORDABLE HOUSING INNOVATION MARKETPLACE BIG PLANS FOR SMALL COMMUNITIES USDA RURAL DEVELOPMENT Section 538 Guaranteed Rural Rental Housing Program. 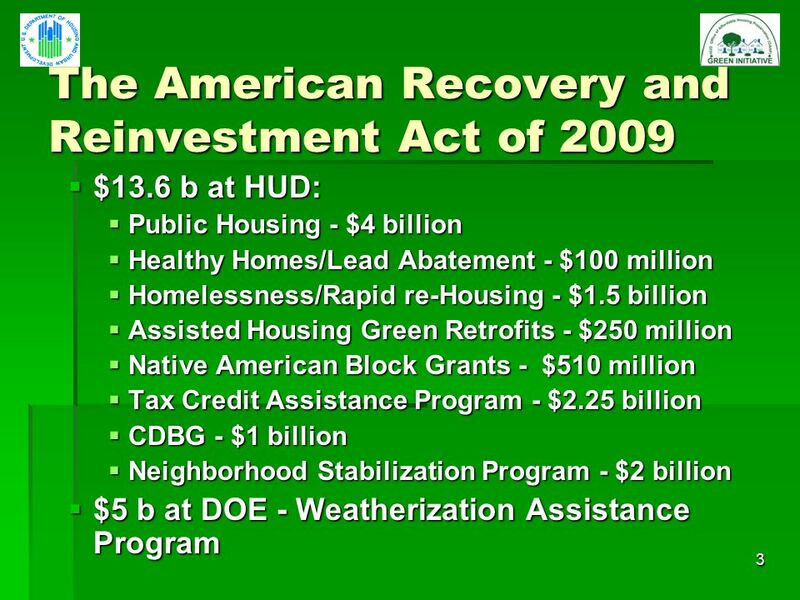 Michael Bodaken National Housing Trust Ohio Preservation Summit: 2010 Affordable Housing Preservation: An Historical Perspective Michael Bodaken, National.